Nissan hosted Jay Leno on his first ever trip to Japan recently and Jay’s impressions of the Japanese car culture are insightful. In Japan the overall culture of personal responsibility is highlighted by the car culture. People there tend to overall have a much higher level of personal responsibility, particularly with regard to how they demonstrate and display their pride in self to their fellow citizens. Although the vehicles are in general smaller, lighter, and in many cases slower than the models sold in America, they are no less valued by their owners. Jay’s comments are spot on. Jay didn’t point it out in his comments, but the first thing one often notices when being invited into a Japanese car owner’s pride and joy is the polite request to remove one’s shoes. The inside floor mats of Japanese cars are often just as clean upon trade-in as the day they were delivered to the owner. It is also common for the cars to have white lace doilies draped over the backs of the headrests and tops of the seats so as to not cause any discoloration of the fabric or leather. Cup holders are a big no-no. Eating and drinking inside a car in Japan is looked upon with horror by owners and enthusiasts. 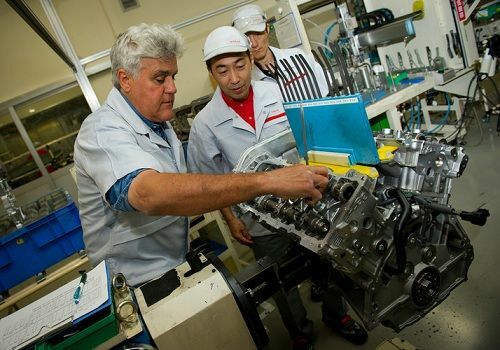 Jay also toured the Nissan GT-R manufacturing area. Godzilla is like the Chevy Corvette in America. It is looked upon by many with great national pride. The GT-R (Godzilla) is the present version of the Skyline which is a name spoken with awe and respect. Although Jay is no stranger to automotive workings and engine builds, he was impressed saying "An engine like this is so labor-intensive, so it's fun to see the mixture of computerized technology with the old hand-eye stuff. It's very quiet in there. It's like being in a library, everybody tiptoes around and each worker does his job. Nobody's looking at a clock. They only build 13 engines a day – and that's a whole group, so it's quite methodical. They take their time, and it's a fascinating process to watch just to see how it's done." During one factory tour in the 1990s this author watched as an engineer carried a hand-built pump to a shipping area. With great solemnity he asked the permission of the employee who usually packaged products for shipment, and then with incredible care packed the pump himself. Each piece of packing tape was perfectly sized, carefully laid on the box, and smoothed over by hand. The box looked like a Macy’s Christmas gift display when it was done. This is the sort of car and personal pride taken by Nissan’s builders when they assemble one of the engines they make. It is always refreshing to see how other car enthusiasts live their dream. Jay Leno has a knack for seeing a scene and making the description funny and insightful. Note – The author has visited Japan 3 times as a guest of an over the top car enthusiast who drives German (!) touring cars. Thanks to Shun Ozawa for his hospitality and friendship.